Let’s dive into how the mechanic works. This week we announced The Sims™ 4 Get Famous Expansion Pack* And, we’ve got a lot of ground to cover. There’s more than one way to get famous, as you’ll find out, but here we’re going to explore what can happen when your Sim is on their way there. For even more on this subject, don’t miss the Fame Mechanic livestream happening on November 2, 2018. So, where does a star begin to rise? It all starts in Del Sol Valley – Mirage Park to be exact. This is where talented up-and-comers reside, honing their craft, going on countless auditions, and streaming their way to the top of their respective industries. No matter which path to Fame your Sim chooses, it will have twists, turns, and even some detours, but it will all be worth it when – one day – they can finally come home to a gold-plated toilet. 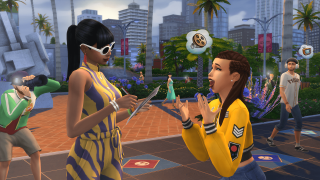 Each Sim who lives in Del Sol Valley has a Public Image, which is a combination of Reputation and Celebrity Level. As their Celebrity Level rises, they’ll earn Fame Points, unlock perks, and gain benefits like slipping past the velvet rope at the hottest spot in town. There are many ways to earn points and get perks. Your Sim can perform music or jokes at open mic night, donate to their favorite charity, get an A-lister to hang out with them (fingers crossed! ), or even be the child of famous parents. Anyway, back to the perks. Has your Sim ever wanted to be a fashion trailblazer? Well, they’ll see it right before their eyes when other Sims begin dressing like them. Or, how about a fan favorite? When your Sim drops everything to strike a pose on Starlight Boulevard, passersby just might faint. But don’t worry about picking those fans up. Bouncers can deal with them. When your Sim unlocks the squad perk, they’ll lead a pack of other faaaabulous Sims they just can’t live without. Sims can’t possibly be celebrities without rolling up with an entourage. Fair warning: fame comes with a price, and we’re not talking Simoleons. Fans and Stans can act, um, a little strange around your Sim. And don’t even get us started on the paparazzi. Can’t a celebrity live in peace?! Unless they choose to don a disguise, not really. Now that your Sim is a proper celebrity, and they’re literally shining from head to toe, it’ll be the perfect time to move to The Pinnacles. They can look down upon the little people, thank them, and fall fast asleep in their pod. Yes, their pod. Stay tuned for much more about Get Famous, which releases November 16, 2018 on PC and Mac. Check out The Sims 4 Forums, follow us on Twitter and Instagram, like us on Facebook, and subscribe to our YouTube channel for all of the latest. Sign up for The Sims 4 newsletter to get updates, exclusive offers, and more (including other EA news, products, events, and promotions) by email and get Grim's Goulish Guitar for free!